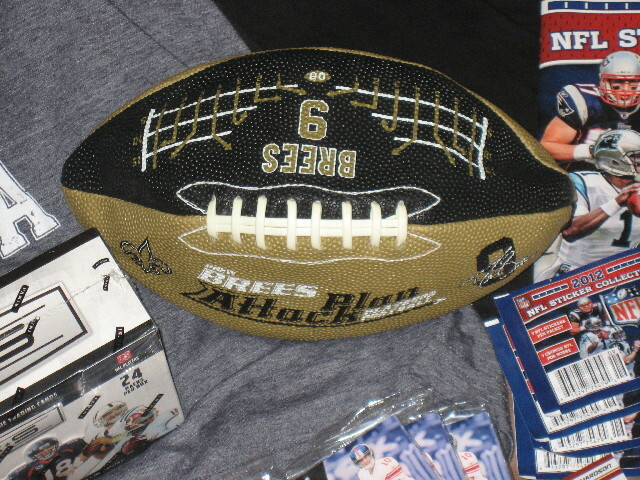 End Of Contest Blowout Quiz - Use this link. Make sure you read all of this post. 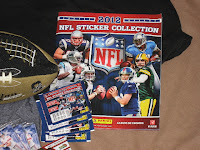 At the end I will have more ways to pick up bonus entries in our contest. Those of you that have been reading my blog for a while know how I run my contests. 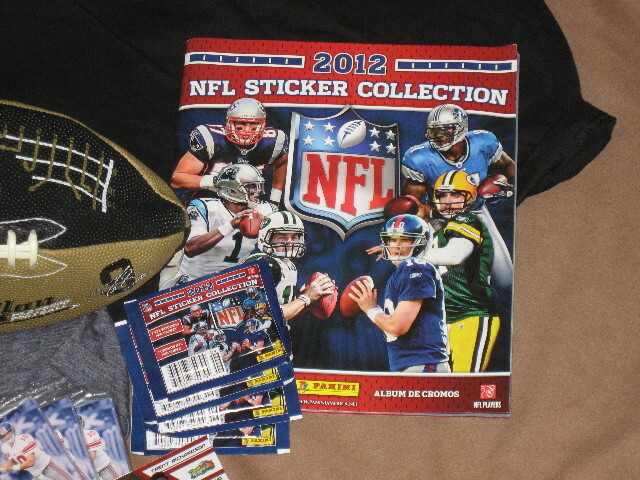 I enjoy what I call the “Early Adopter” period of my contests, the time before I even announce what prizes can be won. That period is officially over and as usual, I will be selecting a special prize that can only be won by those of you that participated during that time and that is plenty of you. But that field is about to get larger. 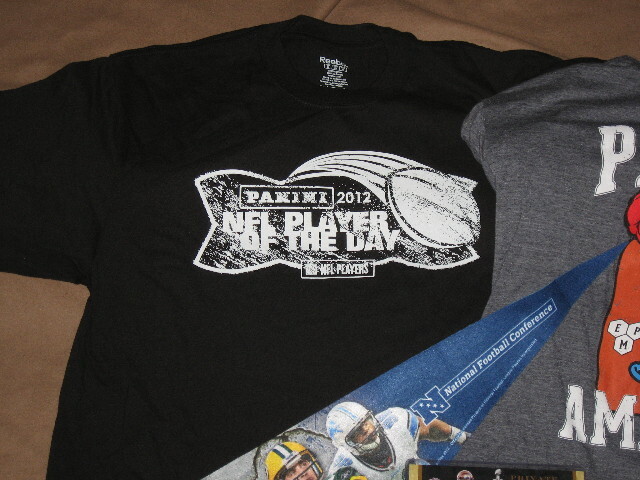 Here are the prizes that I will be giving away thanks to Panini America and their 2012 NFL POD Promotion. keep things fair and give more people a chance to win. You must either be following us here on the blog, Twitter or like us on Facebook for your entries to count. 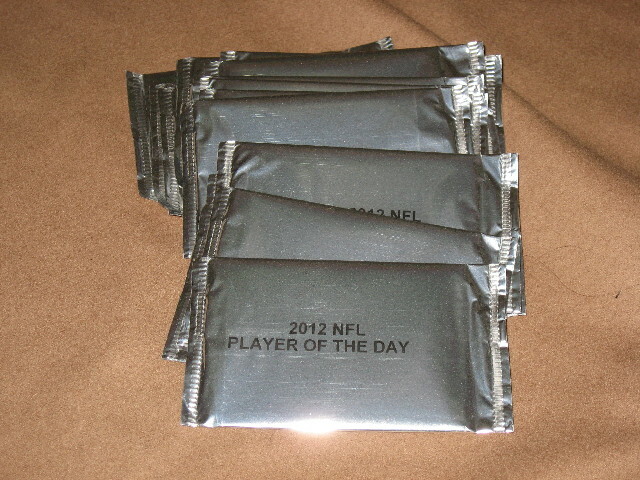 Packs of 2012 NFL Player of the Day cards. 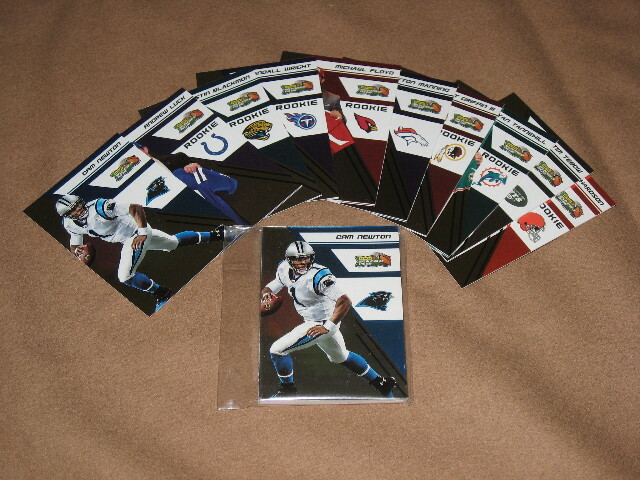 These are the same packs that are given away at your local participating card shop. 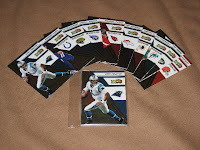 Sets of Panini NFL Player of the Day Cards. 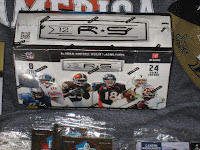 Players include Cam Newton, Andrew Luck, Peyton Manning, RG3, Tim Tebow, Trent Richardson and others. So those are the great prizes that you can win. 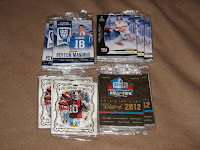 Most of these will be given away in our overall contest entry pool. Some I will give away in mini contests that will be spread across our blog, twitter feed and Facebook page or sometimes exclusively only on one of those sites (who knows, I might even do one on our YouTube channel.) You will have short windows of opportunity to get in on those mini contests so make sure you keep checking in frequently. 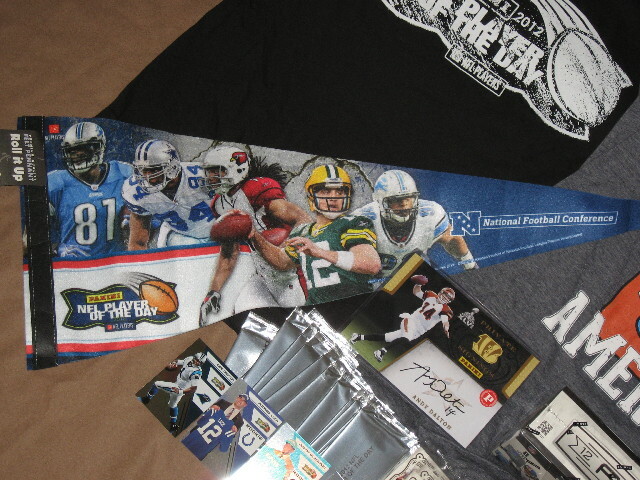 And now here is your chance to pick up to 15 entries towards winning some of these prizes. The first 5 entries are for those of you who are hooked into social media, it is all about getting the word out there. In addition to your main prize pool entries, there will be a separate prize for those who do at least one of following two tasks. For posting on your blog, plugging our contest and including a link back to this page you will get 3 bonus entries. For those of you on Twitter, go to Panini's NFLPOD Twitter account, @PaniniPOD and follow them. Then tweet this - @PaniniPOD Now following you. @AllAboutCards #NFLPOD -. 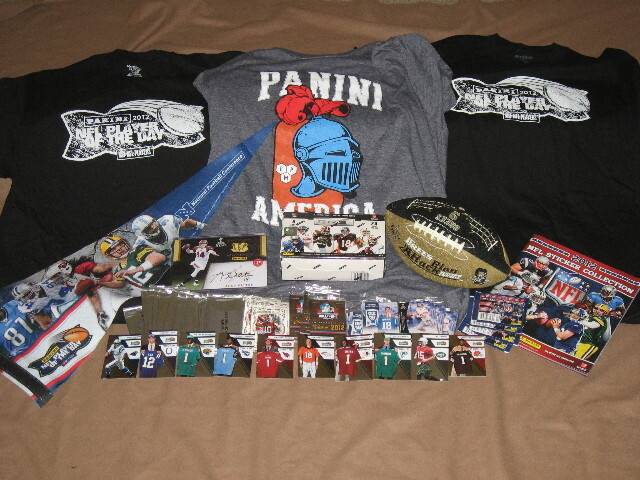 Not only will you get 2 bonus entries from us, you will now be eligible to win daily prizes offered directly by Panini through that Twitter account. Please send me links for all of the above so I can verify them. Here is the way to earn the final 10 entries. Below are 10 questions. For each one you answer, you earn one entry in our main prize pool. You do not have to answer all 10, select as many as you want. Leave your answers in the comments section here on the blog, or on our Facebook page or by sending your answers by email to - ACCNFLPOD (at) Yahoo (dot) com - along with where you follow us (blog, Facebook or Twitter) and your username on that site. Here are the 10 Questions. 1 – If you had to choose only one prize to win, which one would it be? 2 – Picking one prize from each of the remaining groups, what else do you hope to win? 9 – For everyone, US and aboard, where do you purchase MOST of your cards, at your local card shop, at a one of the larger retail stores like Target or Walmart, or online? 10 – When was the last time you traded cards face to face with someone? We will be giving away prizes and entries in our main prize pool through late November. Good luck to everyone! Happy to Pimp the Contest! I am new blogger, so please check out my blog as well. 2 – Picking only one from the other levels, which prizes do you hope to win? 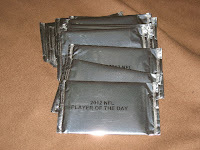 Packs of 2012 NFL Player of the Day cards. 4. How many shops are listed for your state? 5 – Now look at the list of participating shops in your state. Which one is the closest one to you? 6 –Is this shop within 50 miles of your home? 7 - Have you ever been to this shop? 8 – Do you have the ability/means to get to this shop or is it really difficult? 9 – For everyone, US and aboard, where do you purchase most of your cards, at your local card shop, at a one of the larger retail stores like Target or Walmart, or online? All of the above. 10 – When was the last time you traded cards face to face with someone? 35 years ago. 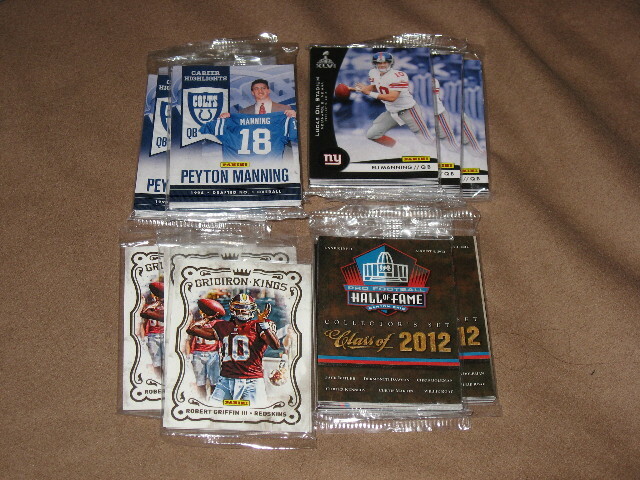 Packs of cards, Peyton Manning Career Highlights, Super Bowl XLVI, Panini National VIP Exclusives and Hall of Fame Class of 2012. 8 - It's a little bit out of my way, but I go there at least once a month to pick up supplies. 1. Andy Dalton from Group 5. 2. Any packs love to open packs. 9. usually at local shows or on-line. 10.within the last couple of months. 1. 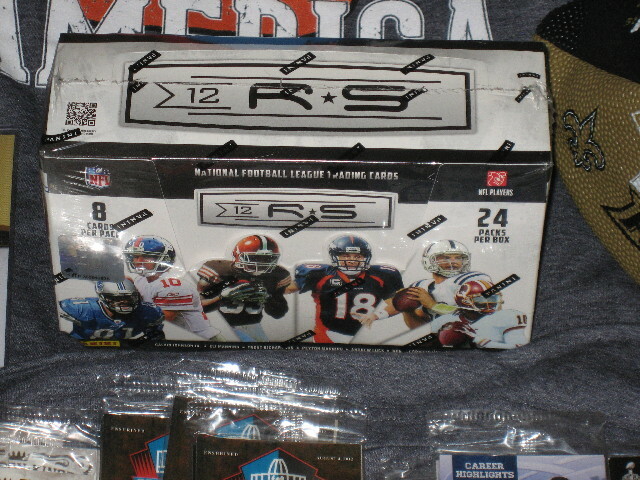 Sealed Box of 2012 Panini Rookies & Stars NFL Football Cards, Who doesn't like to open some wax? 8. I could get there but would be a little drive. 10. A few months ago.